As a supplement to Volume #22, we also present the separate publication Beyroutes, a guidebook to Beirut, one of the grand capitals of the Middle East. Beyroutes presents an exploded view of a city which lives so many double lives and figures in so many truths, myths and historical falsifications. Visiting the city with this intimate book as your guide makes you feel disoriented, appreciative, judgmental and perhaps eventually reconciliatory. Beyroutes is the field manual for 21st century urban explorer. With contributions by Maureen Abi Ghanem, Romy Assouad, Hisham Awad, Cleo Campert, Joane Chaker, Tony Chakar, Zinab Chahine, Steve Eid, Christian Ernsten, Christiaan Fruneaux, Edwin Gardner, David Habchy, Mona Harb, Pascale Harès, Jasper Harlaar, Janneke Hulshof, Hanane Kaï, Karen Klink, Niels Lestrade, Mona Merhi, Elias Moubarak, Tarek Moukaddem, Kamal Mouzawak, Joe Mounzer, Alex Nysten, Nienke Nauta, Ahmad Osman, Haig Papazian, Pieter Paul Pothoven, Rani al Rajji, Joost Janmaat, Jan Rothuizen, Ruben Schrameijer, Reem Saouma, Michael Stanton and George Zouein. 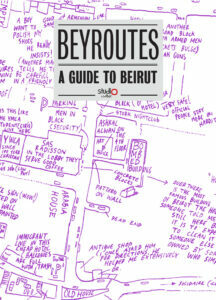 Beyroutes was initiated by Studio Beirut in collaboration with Partizan Publik, Archis and the Pearl Foundation. Supported by Prince Claus Fund, Fund Working on the Quality of Living and the Netherlands Embassy in Lebanon. Archis Never Walk Alonely Planet series – city guides with an eye for people.